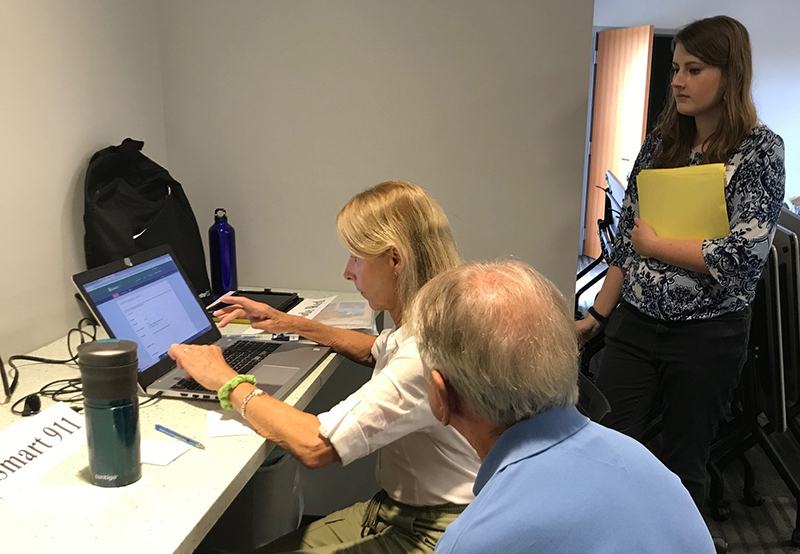 UD student Christine Hoh helped seniors register for the Smart 911 system at a workshop led by Coastal Hazards Specialist Danielle Swallow. When people consider retiring in southern Delaware, often they think about the proximity to the beach and being able to soak up the summer sun with their toes in the sand. What they might not consider, however, are things like the closeness of medical facilities or even family members who might be able to assist in an emergency. With help from Delaware Sea Grant, residents of Sussex County are getting an education on just that: disaster preparedness and tools for aging in place. Danielle Swallow, coastal hazards specialist for the Delaware Sea Grant, said that with more than 30 percent of the Sussex County population projected to be over the age of 65 by the year 2030, and with that number increasing dramatically along the coast, it is imperative to have citizens prepared in the case of an emergency. Lewes has an even greater percentage of aging adults, many of whom live away from close relatives, and so Swallow said it made sense to have a workshop there that focused on preparing aging adults and those with disabilities for storms and other emergencies. Plus, the City of Lewes has an active hazard mitigation committee and the mayor was interested in more public outreach. “The idea was to connect them to information that is specifically tailored to their unique situation and help them grow their support network and come up with contingencies for any health and mobility needs in an emergency,” said Swallow. Workshop participants heard from the emergency managers for Sussex County and the City of Lewes, as well as the director of the Greater Lewes Community Village, a non-profit that helps older adults maintain their ability to live independently. UD students from IPA, which is housed in the Joseph R. Biden, Jr. School of Public Policy and Administration, were on hand to help the older adults use laptops to sign up for Smart 9-1-1, a service that helps first responders protect individuals by providing them with more personal information such as medications an individual takes and emergency contact numbers. They also helped the Lewes residents sign up for CodeRED, an emergency notification system to alert property owners and residents of information they need in the event of a local emergency or disruption in service. Lewes Mayor Ted Becker said that it was great to have Swallow discuss sea level rise, storm surge, the importance of understanding risks for residents living in or near a floodplain and the importance of having an emergency plan in place, as well as having UD students and members of IPA on hand to help the residents sign up for the emergency alert programs. Becker added that having University members inform the community brought a level of expertise and credibility to the topic. Becker noted that having Joe Thomas, the director of Sussex County’s Emergency Operations Center, on hand also added a level of importance to the workshop. The workshop was co-sponsored by the City of Lewes and the Greater Lewes Foundation. In addition, support was provided by Sussex County, Beebe Hospital, and the Delaware Emergency Management Agency. Swallow gave a presentation on risk communication, highlighting the strategies she used during the Lewes workshop to communicate risks with a vulnerable population, at the Regional Conference of the American Planning Association in Rehoboth Beach.